Doris was in the audience! 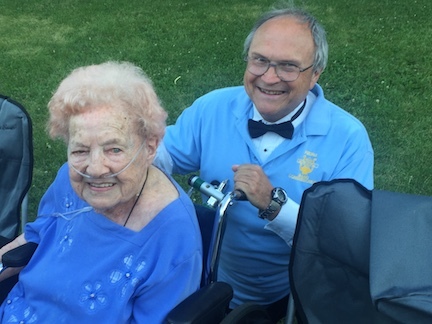 Doris Snyder attended the Sunday, July 8 concert of the Peoria Municipal Band at Glen Oak Park. She has enjoyed the performances for years and will be 110 on August 10th. Lee Wenger, band commissioner and vocal soloist, is pictured here with Doris thanking her for her support of the band.